Our reformer classes are designed for everyone at all levels, based in our newly built high-tech studio. Our signature workout! Combining strength and conditioning with highly beneficial mind & body principles of pilates. The gap is bridged between athletic conditioning and healthy core centred movement. Creating a balance in full body postural strength, alignment, tone and mobility. Low impact in nature, it's a highly empowering, uplifting and rewarding experience for the beginner, the pro and all of us in-between. Dynamic Pilates with cross over fitness for an intense workout. A real pilates bootcamp incorporating elements from HIIT, Plyometrics, Weightlifting and Powerlifting. The answer to cardiovascular fitness and total body strength & conditioning. Be in the best shape you've ever been! Added kettlebell intervals bring a more athletic, energising and dynamic boost to the signature class (Dynamic Pilates) on the 'Powerformer'. Improving overall strength, joint health and cardiovascular fitness. Be the strongest and fittest you've ever been! Our signature Dynamic Pilates class using our 'Powerformer' with intervals of high impact body weight exercises to increase the heart rate and post calorie burn. Training your muscles to be more explosive, useful for improving speed, agility and power. You must like star jumps and burpees to feel the love for this class! Be the fittest you've ever been! Most people may think Pilates is just for women...? Think again! Pilates was created by a man for men and women alike. Dynamic Pilates is an effective form of exercise because it develops core strength and improves posture and alignment. That's something men can benefit from just as much as women. What's the point of being fit and strong but weak through the centre. That in itself can lead to lower back pain... Hence why we have included a mens only class to introduce our signature pilates moves on the 'Powerformer' especially for the male masculinity. More classes to follow if demand is high. 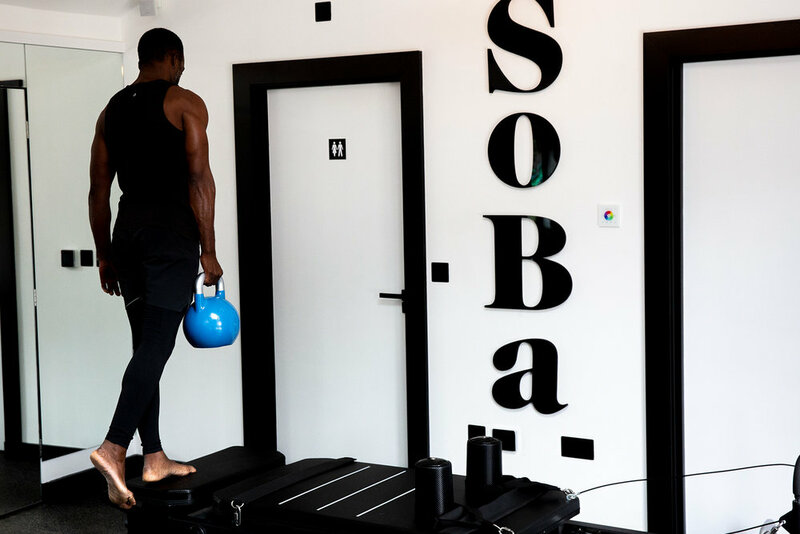 We offer a range of small group Pilates classes based around SoBa's designed ‘Powerformer’ Pilates reformer machine. Book now and boost your fitness regime.